DeGeorge Hotel (Circa 1913). Courtesy of Michaelene "Miki" Lusk Norton, The Lancaster Hotel. DEGEORGE HOTEL. The DeGeorge Hotel, located at 1418 Preston Avenue in Houston, was built in 1913 and opened on January 8, 1914. 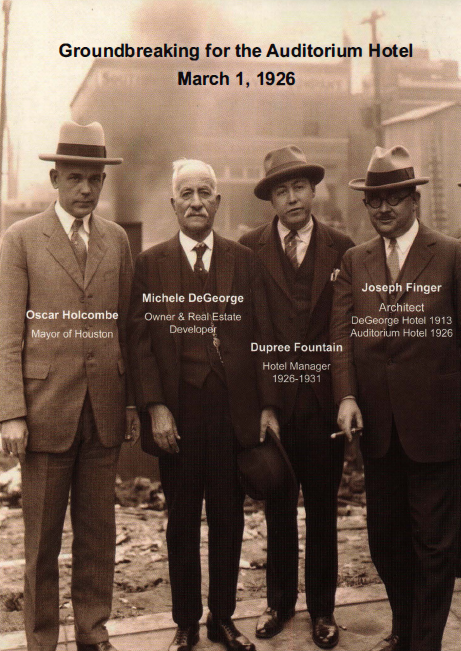 The hotel, named for owner Michele DeGeorge, was one of Houston’s first fireproof buildings, constructed of concrete and steel, and the first large commercial structure in Houston designed by Austrian-born Joseph Finger of Green & Finger Architects. The ground floor had an office and large glass windows to allow for storefronts. The spacious lobby served as a convention hall, while the east room allowed traveling salesmen (“drummers”) to display their wares. Eventually a tailor shop, a barbershop, a drugstore, and a poolroom filled the space. The café was located on the west side and had its own entrance. Original terrazzo floors, seven-foot-high walnut wainscoting on the walls and pillars, and the large white marble reception desk are extant. The six-story hotel was advertised as modern and elegantly furnished, including telephones and hot and cold running water, with rates of $1.00 and up. Some of the 105 rooms had private baths. Transoms over the doors allowed for airflow. Michele and Ursula DeGeorge. Courtesy of Michaelene "Miki" Lusk Norton, The Lancaster Hotel. Image available on the Internet and included in accordance with Title 17 U.S.C. Section 107. Hotel owner Michele DeGeorge and his wife Ursula were immigrants from Sicily who arrived in Houston in 1884. When in 1906 the Houston Post reported that twelve city blocks on the east side of downtown had been condemned in order to build a large railroad complex for the Houston Belt and Terminal Railway, DeGeorge, a successful businessman and real estate investor, realized that the construction of passenger and freight terminals presented an opportunity for building a large hotel. That same year DeGeorge purchased the north half of Block 49 (one of the original sixty-two blocks platted upon the founding of Houston in 1836) on the south side of Buffalo Bayou. This was on the south side of Preston Avenue between LaBranch and Austin streets. Webs of track were ready for railcars in January 1908. Three years later a grand building, designed by the New York firm of Warren and Wetmore, was completed and named Union Depot. In 1913, two years after the Union Depot opened, Michele DeGeorge built his first hotel, the DeGeorge Hotel at 1418 Preston, to serve travelers arriving at the terminal. M. DeGeorge & Sons, Inc., was the name of the development company, and his partners were his adult sons Gaspar and Bernard. Gaspar became the first hotel manager. Both had been serving as rent collectors for their father’s investment properties. The hotel was two blocks from the depot, one block from the new, exclusive three-story Turnverein, and near the 1910 Harris County Courthouse. The DeGeorge Hotel placed its first newspaper advertisement with the train schedule beginning on January 10, 1914. The electric streetcar, which ran through the 1940s, passed in front of the hotel on Preston Avenue as advertised in Houston city directories. The hotel had a garage. In 1914 a special ad stated ladies and children visiting without escorts were given special courtesy. Low rates were available for permanent hotel guests, and in early Houston long-term residency was a common practice for individuals and families. Permanent guests were lawyers, court stenographers, salesmen, dental students, train conductors, as well as the general manager, hotel cook, and electrician. Some of the long-term residents were the newly-married children of Ursula and Michele DeGeorge. In 1920 daughter Lena married Tanny Charles Guseman, and in 1921 son Gaspar married Josephine Pinto. Michele converted several bedrooms into suites for each family and their children. Newborn Lenora Guseman slept in a dresser drawer lined with the finest linens. Hotel guests often included ranchers from Richmond, Texas, who were a bit on the wild side and prone to shooting their guns off inside the hotel’s halls and lobby. Michele then insisted his families move back into the DeGeorge residential compound at 918 Bagby Street. In 1938 the Houston Chronicle described Houston as having more first-class hotels than any city in the South. Twenty-five first-class hotels included the Auditorium Hotel, Ben Milam Hotel, DeGeorge Hotel, Milby Hotel, and the Rice Hotel. Groundbreaking for the Auditorium Hotel. Courtesy of Michaelene "Miki" Lusk Norton, The Lancaster Hotel, and Houston HIstory Magazine. Image available on the Internet and included in accordance with Title 17 U.S.C. Section 107. DeGeorge was a leader among Italian immigrants who had settled in Houston, and his fellow immigrants trusted him to safeguard their money in his hotel safes. Into the twenty-first century, the original safes have remained at the hotel. Upon the death of Michele DeGeorge in 1927, hotel ownership passed to his three surviving children—Rosalie DeGeorge, Lena DeGeorge Guseman, and Gasper DeGeorge. By 1970 ownership rested with Lena’s three daughters: Lenora Guseman Smith, Ursula Guseman Lusk, and Michelene Guseman Toomey. In 1978 the property was sold to Klonis, Inc., who renamed it the King George. Through the decades, overseeing management of the estate had been the responsibilities of Gasper DeGeorge, Tanny Charles Guseman, and John J. Toomey. Passenger activity at Union Depot, (later called Union Station) was busy until the late 1960s; then airline travel became more common. The train station closed in 1974. Eventually the east side of Main Street fell in popularity, and the hotel suffered from poor maintenance. Guests in the 1960s and 1970s were Greyhound Bus drivers, long-haul truck drivers, wrestlers, and other low-income travelers. The hotel, however, remained profitable. In the 1980s the area and hotel went into further decline. The DeGeorge Hotel was eventually boarded up. DeGeorge Hotel at Union Station. Image available on the Internet and included in accordance with Title 17 U.S.C. Section 107. In 1996 the Housing Corporation of Greater Houston purchased the hotel and parking lots and planned to renovate and convert the hotel into single-room occupancy for low-income tenants. Under the leadership of Tom F. Lord and Earl Hatcher, the hotel was renovated in 2000 and renamed The DeGeorge at Union Station. It provides housing for 100 U. S. veterans. This successful adaptive reuse of the DeGeorge has led to the preservation of a historic Houston railway hotel while maintaining responsible redevelopment for downtown. Two of Michele DeGeorge’s great-granddaughters served as consultants—Charlene Lusk Dwyer as the interior designer and Michaelene “Miki” Lusk Norton as the historian. The DeGeorge at Union Station Dedication, May 22, 2001. Houston Chronicle, November 24, 1915; August 17, 1927; August 25, 2000; May 20, 27, 2001. Houston Daily Post, February 25, 1906; March 2, 1913; September 1, 1913; January 5, 10, 11, 1914. Lenora Guseman Smith, Interview by Michaelene “Miki” Lusk Norton, 2005. John Jay Toomey, Interview by Michaelene “Miki” Lusk Norton, November, 2008. Michelene Guseman Toomey, Interview by Michaelene “Miki” Lusk Norton, 2005. Handbook of Texas Online, Michaelene “Miki” Lusk Norton, "DEGEORGE HOTEL," accessed April 22, 2019, http://www.tshaonline.org/handbook/online/articles/ccdeg. Uploaded on October 24, 2016. Modified on March 11, 2018. Published by the Texas State Historical Association.